Dawn is well-known around the veterinary and shelter communities as a flea killer and flea deterrent. Vinegar removes oils from the coat and skin while leaving fluffy, irresistibly soft fur behind. Despite knowing these things, I’ve continued to pay for far more expensive bath products for Bentley (our pug), trying to combat his pheromone-induced ‘doggy’ smell. Not completely satisfied with any results so far, I decided to see if there was something more ‘natural’ out there that could answer my prayers. Yes, I love my dog so much that I include his hormone and scent issues in my prayers. Like an over-protective parent, I’m always worried about what others will think upon first meeting him. I couldn’t have any smell, especially when it’s not his fault, overshadow his radiant personality and his zest for life. I needed to make sure he had an equal opportunity at being loved by all who meet him. As he deserves. With this new concoction all mixed up, and approved by our vet, we set off for the bathroom. If seeing is believing, consider me ‘blinded by the light’. Bentley looked positively radiant after his scrub down. I believe my exact words to him (in my best Billy Crystal accent) were ,”Dahling, you look mahvelous. Absolutely mahvelous.” Speaking of which, with his new luster, Bentley would look really cute with a pair of wings and a halo for Halloween this year, like a little angel. But I digress. He was clean. Not a single flea in sight. He was fluffy. No hint of oil or his ‘doggy’ smell. I actually carried him to each of my children, and my poor husband, and made them smeeeeell him. Not a little sniff, either. That just wouldn’t suffice. I mean nose in the fur, and a deeeep inhale. ‘See, not a whiff of anything!’ I don’t think they understood my elation. I may or may not have seen them exchanging looks, silently asking each other if Mom is OK. They just won’t understand until they’re older. Or so I tell myself. For virtually nothing on my part, I’d achieved groomer-level results. Or at least that’s how Bentley looked to me. I may be a little biased. Also, as a friendly reminder, no children, pugs, or husbands were harmed in the making, usage, or smell-checking of this recipe. This dog shampoo really does work. Let it help remove those pesky hitch-hikers, keeping your fur baby(ies) flea free, and leaving your pet with a scent-free, fluffy coat to boot. Mix the three ingredients in a large bowl. Transfer to a leftover squeeze bottle (like an old shampoo bottle). Give it a little shake to make sure it is mixed. Apply to your doggy just as you would normal shampoo. It is best if you can massage it into the fur and let sit for 5 minutes. Rinse your doggy thoroughly with warm water. Towel dry. Posted in Pet Supplies and tagged all natural, dog shampoo, fle shampoo, flea killer. Bookmark the permalink. Hey, I was wondering if it would be ok or still effective to add 1c. oats and 1c. 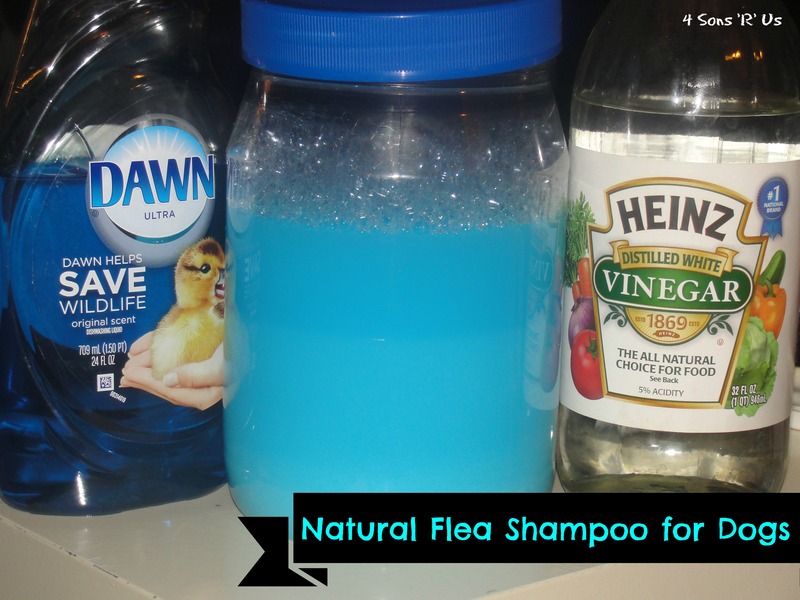 baking soda to the flea shampoo recipe? My fur babies have sensitive skin! I definitely don’t think it would make it any less ‘effective’ since baking soda is deodorizer and the oatmeal a skin soother, but I wouldn’t mix them into the entire batch. I probably only end up using about a 1/2 cup of solution to thoroughly scrub our pup down each bath, and to that I’d separately add 1 tbsp each of the baking soda and oats and mix it up well before lathering. Or you could add 1 cup of each to the bath water and thoroughly wash them down with that. Hope this helps! we’ve got puppies that are 7 weeks old and have gotten fleas bad…how often would I bathe them with this mixture? Does this work for cats as well? What about it stinging their eyes? I buy baby no tears for dogs so my chihuahua’ eys wont sting when I wash his head. You are a hoot in your descriptions of how tortured your family must have been. Sounds like the pain and suffering I help my family experience on a daily basis.I will be trying this on our pups, a golden and shih tzu. The pups won’t enjoy their bath time, but to banish the fleas is a must!